A spike in global LNG supply has led to projected market saturation through atleast 2020. The macro trend toward short-term deals, away from long-term supply agreements will require innovation in financing for new projects. 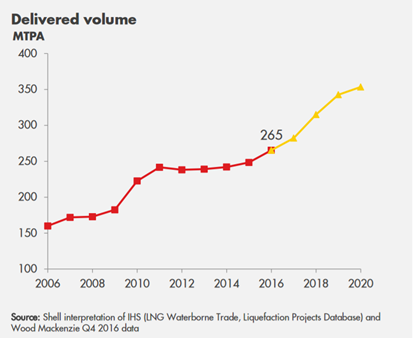 Floating Storage and Regasification Units (FSRUs) have been pivotal in opening up emerging markets. On the week of June 20th, many professionals from across the Liquefied Natural Gas (LNG) industry assembled in Houston to share thoughts, ideas, and information on the past, present, and future of the industry. We are witnessing historic times, as LNG global trade has grown from 155 mtpa (million tonnes per annum) in 2006 to 258 mtpa in 2016 and is further expected to grow to 350 mtpa by 2020, resulting in a 15-year average annual growth rate of 5.5%, more than twice the U.S. GDP growth. U.S.-based suppliers are ramping up from essentially zero to being one of the world’s largest suppliers of LNG in the next few years. In addition to the 70 mtpa of domestic production already authorized and under construction, the Department of Energy has authorized an additional 75 mtpa of LNG to be exported to countries that do not hold Free Trade Agreements with the U.S.
LNG as a fuel source has been a energy staple for many Asia-Pacific countries for decades, and is increasing in importance in other regions, as countries look to diversify their energy mix while lowering carbon emissions. The COP21 climate accord in Paris would further drive the value proposition for cleaner burning natural gas around the world, although the Trump administration’s current position against this agreement casts some doubt on the accord being an incentive for change. In spite of the recent success in LNG as a growing industry, there remain significant challenges to continued development, as outlined at the LNG Summit and summarized below.